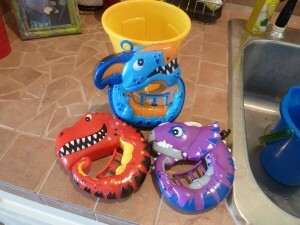 I picked them up because they are great for water fun on hot days but also help build hand strength through squeezing to squirt the water out. If you look closely, you can see that the part they will squeeze to squirt the water is quite long, requiring all of the fingers to squeeze down, which builds hand muscles. Filling it up with water. and provide a purpose either by squirting water into a sand bin or filling a cup or container to a certain point. I recommend first showing them the hole where the water will come out so they are not surprised and can practice aiming. 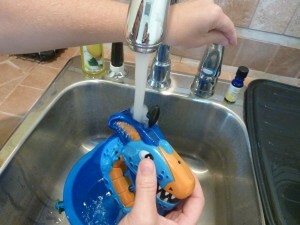 This will also be helpful to not get water squirted around your house! 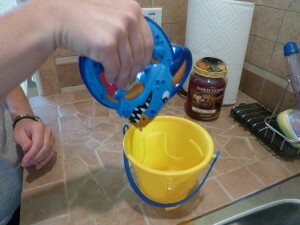 Squirting the water into a sand pail. 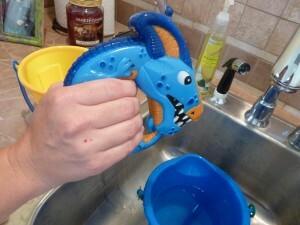 If you have a child who is already familiar with water guns for squirting other people, you may wish to keep this as an outdoor activity, perhaps incorporating it into an outdoor My Obstacle Course. I have to admit that I am one of those moms who is not crazy about children playing with toy guns so this toy will allow him to play and build his hand muscles in the same way!